Surprisingly, Adviser to the Home Minister, Kempaiah, who usually attends all meetings related to law and order and crime, was absent. Bengaluru: Home Minister Ramalinga Reddy held a meeting with senior officers of the Bengaluru City Police on Saturday. Surprisingly, Adviser to the Home Minister, Kempaiah, who usually attends all meetings related to law and order and crime, did not take part in the meeting. The meeting was attended by all senior officers of the city, from Commissioner T. Suneel Kumar to inspectors of all police stations and CCB. 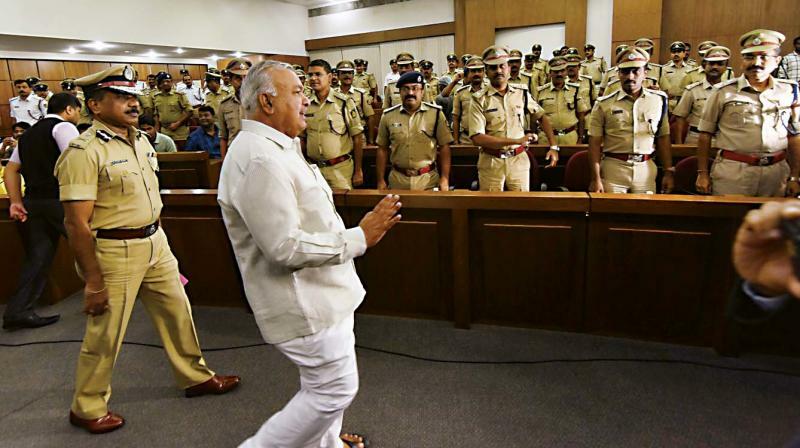 Mr. Reddy told officers that he wanted them to make Bengaluru free of rowdies. “I don’t want the same trend to continue. There are complaints from many localities especially Market, Majestic and Shivajinagar that rowdies are collecting hafta (protection money). I don’t know what you will do, but it has to end. Rowdies should leave rowdyism or they should leave the state,” he said. He asked the officers to get details of paying guest accommodations, its owners and occupants. “I do not budge to any influence. I expect the same from you. Even if someone calls from my office, you need not listen to it. Stick to law. Inspectors will be held responsible for illegal activities in his jurisdiction and strict action will be taken if there are any lapses,” he warned.